The US Government has been in a bind to understand the elusive Millennial generation. Specifically, the US Department of Education, consulted with a group of Federal data scientists who explained that nothing pulls at the hearts of Millennials more than nostalgia. The Education Department was also pleased to find out that nostalgia also caused Millennials to open up their wallets. 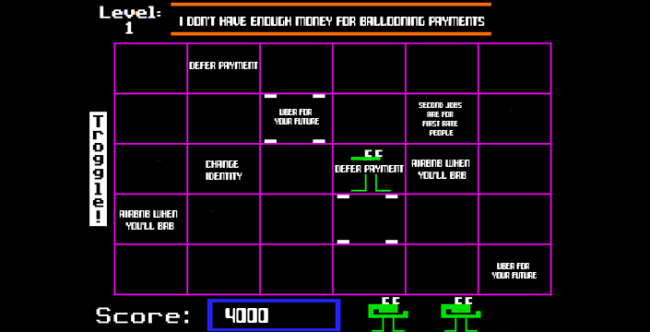 With this new knowledge, they decided to develop a modern Number Munchers game that teaches Millennials great ways to save and to repay loans. The DoED sent out Number Crunchers game free to those at risk or in currently falling behind in payments. There were no ads in the Number Crunchers game, no microtransactions, no attempt to find whales. 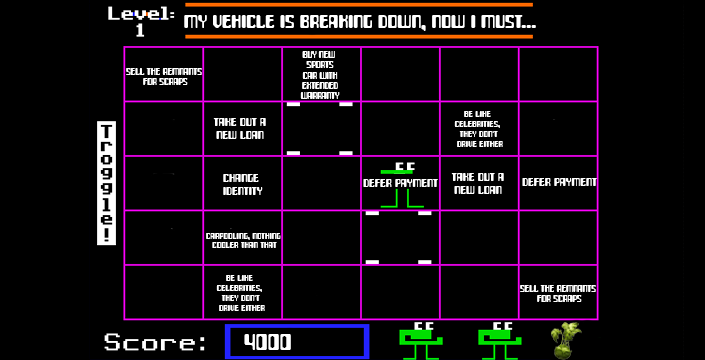 The only purpose of this Number Cruncher game is to teach the Millennials how to get back on track and stay on track with their student loans. -Ask Mom and Dad for any extra cash, *Bonus* Grandma and Grandpa too! -Second jobs are for first rate people. -Use Craigslist to find unconsidered modeling opportunities. -Sell the remnants for scraps. -Use public transportation, slightly better than a portable homeless bathroom. -Carpooling, nothing cooler than that! -Be like celebrities, they don’t drive either. -Half your leftovers, over and over. -Costco offers free food samples. -Go halfsies on a burger with the local bum by using the change you found on the ground. -Unexpectedly take your neighbor up on that dinner invite. Initial studies by the Department of Education have found there has been a measurable positive uptick in repayment of student loans for all accounts. The Education Department is planning on sharing this information with the IRS and all government agencies on how to possibly coerce the masses to be upstanding citizens. There has also been some progress on student loan payments. There are now companies who aid students with student loan forgiveness if they qualify. This is something students can begin to think about, hopefully stopping them from going halfsies on a burger with the local bum!